Liverpool (AFP) – In his first press conference as Liverpool manager last October, Jurgen Klopp said that he wanted to turn the club’s supporters from “doubters into believers”. Six months later, the headlines on the sports pages of Britain’s newspapers on Friday suggested that Anfield has indeed found its new messiah. Where the atmosphere had been as flat as a pancake in that game against Rubin Kazan, against Klopp’s former club Dortmund it crackled with an intensity that recalled the stadium’s greatest European nights. The massed ranks of flare-wielding fans who assembled in the street to greet the Liverpool team bus prior to the game brought to mind the frenzy of excitement provoked by the team’s tilt at the Premier League title in 2014 under Klopp’s predecessor Brendan Rodgers. But it was all part of his attempts to foster a sense of symbiosis between crowd and team — a strategy that reached a dizzying apogee against Dortmund. Klopp revealed that he had invoked the spirit of the club’s unforgettable comeback from 3-0 down to beat AC Milan in the 2005 Champions League final in Istanbul and the fightback also brought to mind the 3-1 win over Olympiakos earlier in that season’s competition that culminated in a decisive 86th-minute goal by Steven Gerrard. Klopp took something of a gamble against Dortmund by replacing injured midfielder Jordan Henderson with Brazilian forward Roberto Firmino. It looked a costly miscalculation as Dortmund raced into a 2-0 lead, but Klopp stuck to his guns in the second half and was rewarded with the 48th-minute Origi goal that set the tone for the late crescendo. It was, in Klopp’s own phrase, “fighting football” — “rainy day, heavy pitch, 5-5, everybody is dirty in the face and goes home and cannot play for weeks after”. Well, 5-4. The ease with which Dortmund cut Liverpool apart revealed defensive shortcomings that Klopp will have to address, with Sakho’s poor positioning a factor in all three of the German side’s goals. 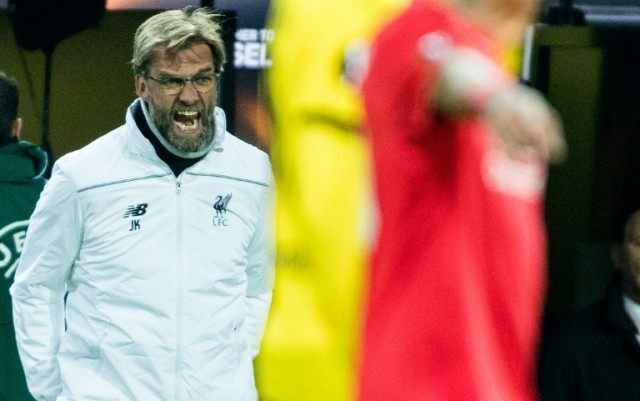 But his players now have precious momentum and that intangible, all-important element that was the calling card of both Klopp’s great Dortmund team and the finest Liverpool sides of yesteryear: belief.